Would you let the pigeon drive the bus? “I’ll be your best friend!” Click here and scroll right for a stop motion video we made today, and an outtake. Thank you to Yottoy for sending us their Pigeon on the Bus plush. Our friends at Wee Society have another amazing book coming out soon and this time it’s one you’ll take with you on trips—just in time for summer, that long-awaited warm season of road trips, jaunts and excursions. We’ve long admired and been inspired by Wee Society’s bright, modern and color-drenched aesthetic and their penchant for the whimsical and the fun. If you have any of their books, you know what we mean about it being impossible not to break into a smile when you start to turn those pages. Their latest book Go! is a unique take on the travel journal, a place to record your latest near or far adventure with a few fantastic surprises in the back (watch the following videos for a sneak peek). The sentence starters included make writing and documenting memories a fun experience and are part of what will make Go! one of the best souvenirs from your trip. It comes in three jacket colors—red, blue and yellow—and we’re already thinking it’ll probably be one our go-to gifts for birthdays this year. This giveaway is open to US and Canada residents and ends Wednesday, March 28, at 11:59 PM PST. Head over to this Instagram post to enter. Scroll right on the post for a preview of the interior of Go! My Adventure Journal and Me: A Compendium. We’re sharing a collection of books perfect for snowy days, rainy days or any day you’re looking for an interesting book to interact with. These books are great for inspiring creativity and thinking about other perspectives. Some of these titles are perfect for budding writers. And they provide engaging tasks for kids who are a little more reluctant to practice writing at home. Each has opportunities for making art (definitely our favorite kind of book). Doing a page or two from one of these books can also a good short break from homework, or a big task where a long stretch of thinking is involved. Read descriptions of each book below, then head over to this Instagram post to flip through the books. Would love to hear about some of your favorite interactive books in the comments below. Happy weekend! Playing With Food is for kids (and people of all ages for that matter) who take their food seriously! It’s a place to discover food from around the world, try your hand at culinary experiments and invent your own versions of dishes and popular foods. It also contains recipes, games and a ton of prompts for writing and making art. Each set of pages is unique. Anyway you slice it, it’s incredibly fun. 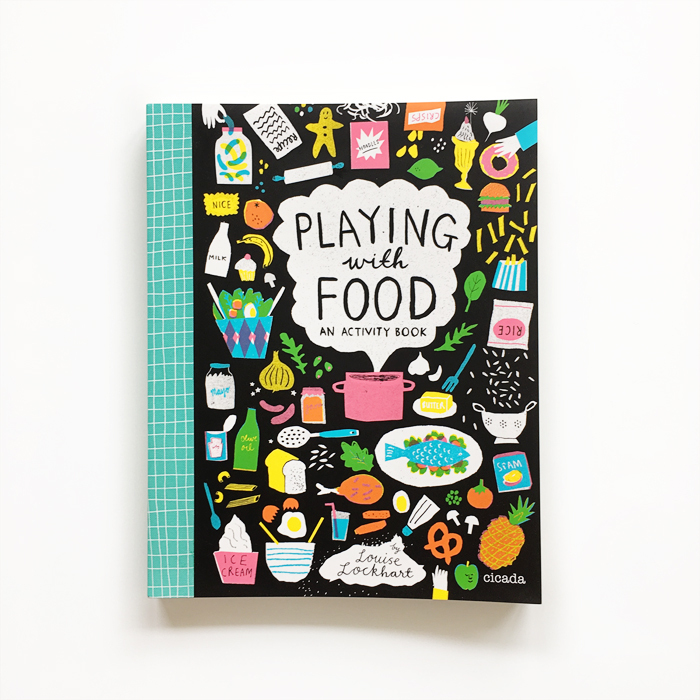 Playing With Food: An Activity Book was written and illustrated by Louise Lockhart and published by Cicada Books. Draw Me a House is a place for kids (or anyone) to learn about “the built environment” and various architectural movements and ideas and elements—form, function, light, shape, pattern, color and line. They’ll draw tree houses, skyscrapers, mailboxes, what they see through windows. They’ll design a house that can withstand extreme cold, finish building an aqueduct and—one of our favorite exercises—sketch an aerial view of the room they’re standing in. 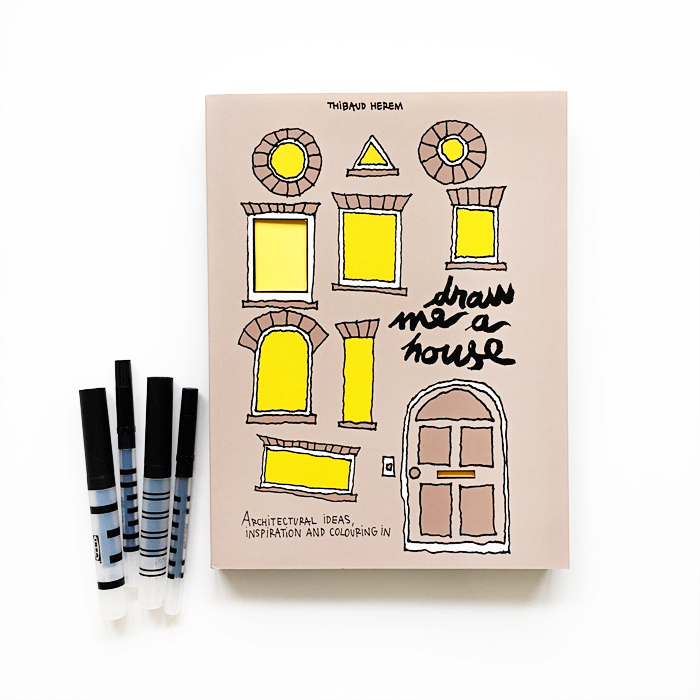 Draw Me a House: Architectural Ideas, Inspiration and Colouring In in was created by Thibaud Herem and published by Cicada Books. In Sticker, Shape, Create, kids use stickers in various shapes to create different scenes of animals, cityscapes, insects, forests, and more. They can then finish the their pictures using pens, markers and the like. A creative way to explore part/whole relationships. Sticker, Shape, Create: A Sticker Art Activity Book was created by Thereza Rowe and published by Princeton Architectural Press. With Read All About It, children can design their own newspapers. Templates and stickers of people, faces, buildings, random things (dinosaurs and explosions being some of them) are included to help finish off your stories of the day so you can call it a day and put your newspaper to bed. After all, you’ve got to get up early at the crack of dawn and make deliveries. Read All About It: Write and Design Your Own Newspaper was created by Alice Bowsher and published by Cicada Books. I Like is a snapshot of a moment in time—kids fill out its pages with facts about themselves including some of their favorite things and what a perfect day would be like for them. They invent their own holiday, answer intriguing hypothetical questions and—we’re still mulling over this one—craft their own ice cream flavors that the world has never seen. And there’s a lot more in store. I Like makes a fantastic birthday gift and is a meaningful keepsake for kids and their parents. I Like… A Great Big Book of Awesome Activities, Delightful Drawings, and Fantastical Fun for Kids of All Ages (That’s You!) was written by M. H. Clark, illustrated by Sarah Walsh and published by Compendium. Also pictured is a set of double-sided What Do We Have Here?! Colored Pencils from Compendium. Bigger asks all sorts of mathy questions (fun ones, actually!). The book is made up of one giant ruler that you can fold out, lay on the floor and use to measure. There are opportunities for comparing and estimating, and fun tidbits about world height and length records. Both centimeters and inches are used in the book. Bigger: A Fold-Out Book of Measuring Fun was written and illustrated by Eleonora Marton and published by Cicada Books. A surprise guest arrived on our doorstep yesterday! Paddington with a new pop-up book in tow — ready to share the sights and sounds of London with us. Paddington 2 is set to arrive in theaters January 12, 2018, and we’re pretty chuffed about it. For a chance to win your own Paddington plush and pop-up book, head over to this post on Instagram.